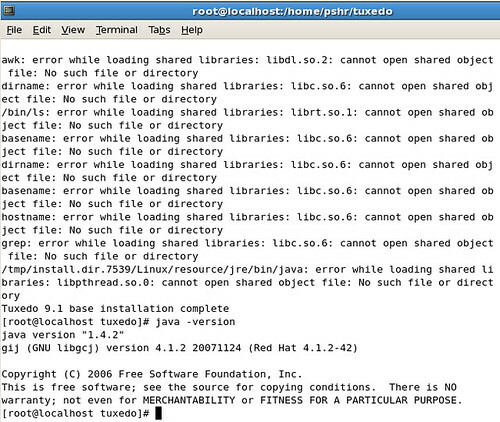 I have been attempting to install Tuxedo on Oracle Enterprise Linux 5. The installation presented several problems, and so, I thought it might be helpful to blog the fixes. Both errors appear to be part of the InstallAnywhere installation system. So, the fixes that I found were not specifically for Tuxedo or even PeopleSoft/Bea. The awk… message looks like it is a problem, but that can be ignored. A couple of searches showed that other people’s successful installs had this error message. As best I can tell, the problem lies in the packaged version of Java. To fix the problem, I first had to install Java. GCJ comes installed by default. I installed Sun’s Java 1.5 by downloading and installing jdk-1_5_0_16-linux-i586-rpm.bin. After that fix, tuxedo finally installed for me!